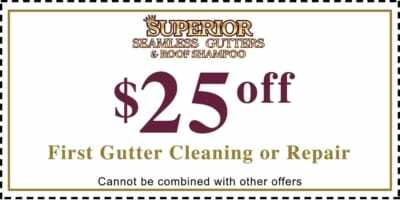 The Superior Seamless Gutters experienced team has been helping homeowners keep their gutters free of debris and working properly since 1993. We use the highest quality cleaning methods to remove sticks, leaves, bugs, and other debris from your gutters so that you can properly drain water away from your home. These issues can cost you thousands of dollars in damages. To keep your gutters and leaders working their best, we recommend cleaning them out 2-4 times each year. We offer an Annual Maintenance Package to help you keep on schedule and worry free. Call us today for a free gutter cleaning quote. If a corner of the gutter is leaking can I just reseal it to stop the drip? 9 times out of 10 the answer is no. If you try to reseal a corner by putting tar or silicone on top of existing sealant, it is likely that the gutter will leak right away again. Replacing the whole corner or end cap is the best solution. Will a dent in the gutter affect its performance? More times than not, it will. The gutter is made of aluminum and when it bends it will never be completely straight again no matter how hard you try. That bend affects the flow of water. If I see water coming out from behind the gutters does that mean they should be replaced? More times than not, the answer is no. Gutters are not sealed in the rear. They are hung on hangers spaced out every 16 inches. Hence if they are clogged, they will over flow in the front and rear. What are some signs that I need to clean my gutters? Looking up at your gutters find where the downspouts come out at the top. If you see very dark streaks in the bends of the elbows, that’s a sure sign that they are clogged. A cleaning should be done ASAP. Also, any overflow during a rain storm needs your immediate attention. Once in late October. Don’t wait until late fall to clean this out. It’s too much weight on the gutters and an early freeze can leave you with this situation for an entire winter. Late November/early December when about 80 to 85 percent of the leaves are down.